What is it like to have achromatopsia? What is it like to go through life with very poor visual acuity, inability to see color, and the most severe form of light sensitivity that can be experienced by the eyes? To have a vision disorder which causes one to experience varying degrees of visual impairment, depending upon the factors of illumination which vary from one place to another? Readers of this book have the opportunity to gain knowledge and understanding regarding this rare and challenging vision disorder. This 163-page spiral bound book (2nd edition), which was published in 1999 and substantially updated in 2004, consists entirely of comments from persons who know firsthand about living with achromatopsia. Adults and teens with achromatopsia and parents of children and teens with achromatopsia tell about how this vision disorder has affected their lifestyles, their relationships, and their approaches to different activities. They tell of their experiences in connection with work, school, recreation and sports activities, and much more. They tell about the problems they have faced and the ways they have dealt with these problems -- i.e., the coping strategies, adaptive devices, support systems, and special resources that have played important roles in their lives. 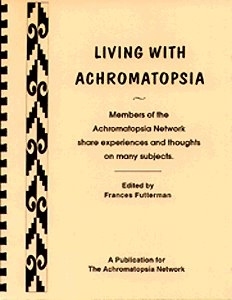 The book, Living with Achromatopsia is NOT in print at the present time. To accommodate those who need to read this very important book, I am making a copy of it available in PDF format. To download a copy of Living with Achromatopsia click on the following link Living with Achromatopsia.